In New York there’s a popular music venue called, The Knitting Factory, which started as a club in Manhattan and is now operating in Brooklyn and a few other cities. 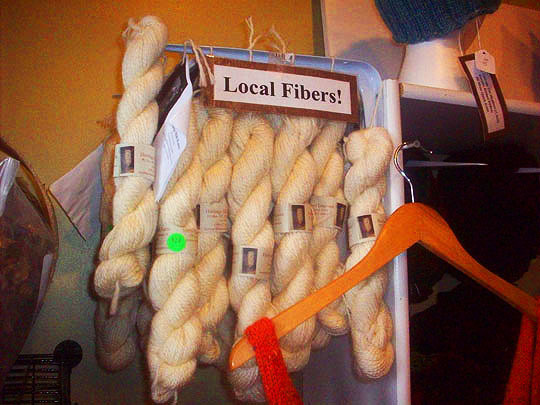 Well, Peoria has its very own knitting factory and that’s today’s Shop Hop destination. 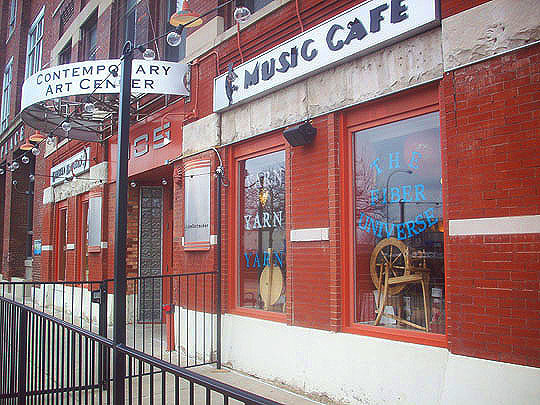 And here we are, Peoria's very own Knitting Factory, The Fiber Universe in downtown Peoria on Water Street in the Contemporary Art Center. If you're still wondering what this store is all about, just look at the window on the left. Yarn Yarn Yarn. Yeah Yeah Yeah. Yada Yada Yada. 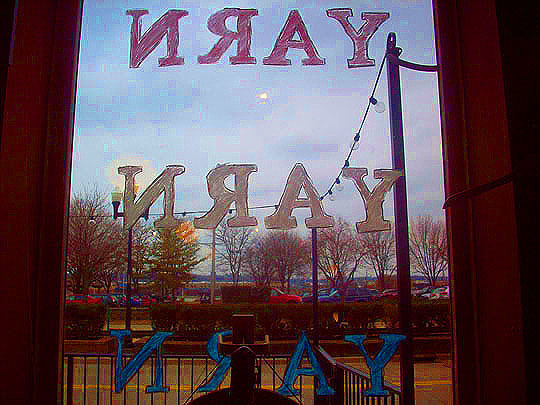 Let's step inside and see what's what. Well, it certainly looks interesting from the outside of the store. 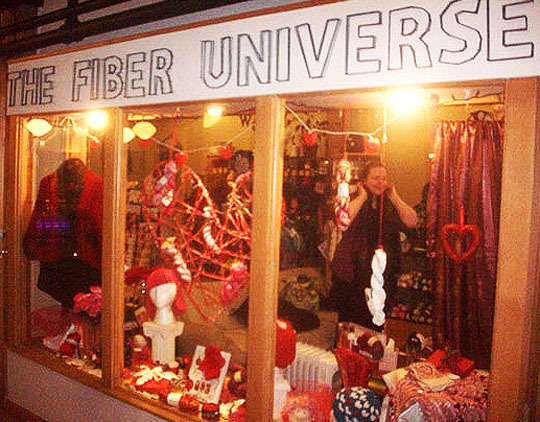 Blondie had a Heart of Glass and The Fiber Universe has a heart of yarn. Very nice and comfy in here, let's go say hi to the women in the middle of the store. Here's Erin, who owns the store along with her friend, Melinda who wasn't here today. The store's been open for over a year and Erin says business is great. 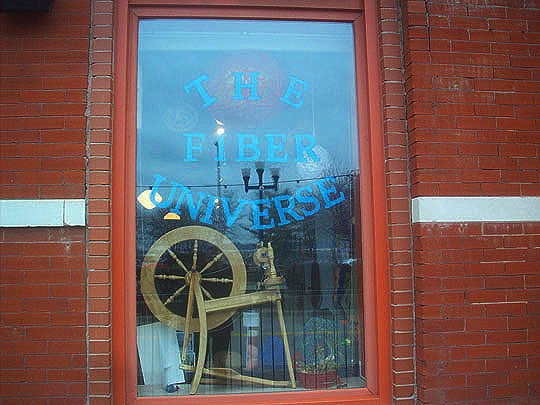 It helps that Fiber Universe is Peoria's only yarn store. Nice to have that local niche! 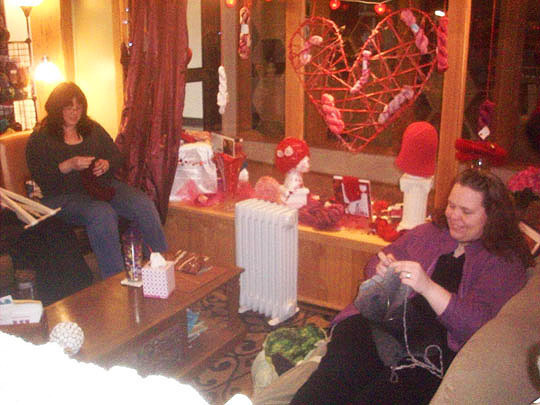 Erin invites customers to hang out and knit in the shop and that's exactly what customers Tammie and Melissa are doing here today. One thing I noticed was there's a lot of sheep in here. There's another one up there. Erin told me people bring in sheep items to the store as gifts, like this sheep painting. I asked Erin why in the world people give her sheep knick-knacks and paintings and she explained that the wool in yarn comes from sheep. Talk about your "duh" moments! In addition to yarn, there's also hats and knitted clothing for sale in here, most of it made by owners Erin and Melinda. 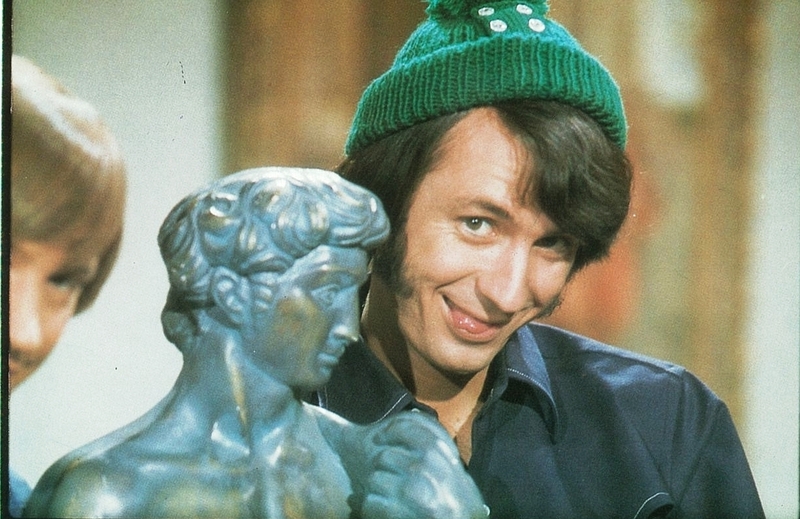 I love the monkey hat, that would be the perfect gift for Michael Nesmith! To a one-of-a-kind, blue knit dress. Suddenly...socks! And notice the sheep painting photobombing the shot in the background. Like I always say, shop local! 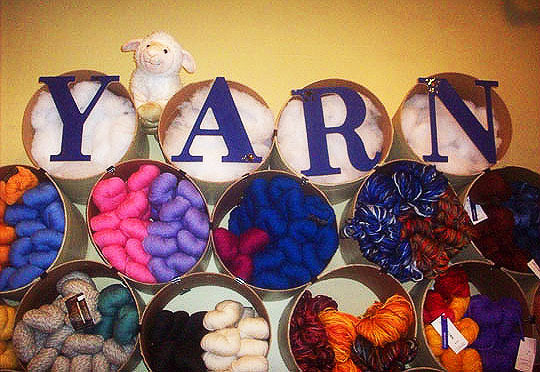 Wow, look at all the yarn in here, they certainly live up to their name! There's knitting classes held here every Saturday morning and they take place around this oval wooden table. You can sign up for a class online by clicking here. Here's some magazines that I'm sure have some ripping great yarns to read in them. Oof! Sorry about that, Chief! Okay, time to make a purchase in here and support this local store. I don't know how to knit, so I thought I'd buy an instructional book on the craft of knitting. Since I've always been a Zombies fan, I thought I'd buy this book. I think I'll start off with trying to knit Rod Argent. And a quick glance out the front window and I'm on my way. See ya tomorrow! Further Reading: Knitmap, CI Proud and facecrack. Poor little critter on the road.